If you received (or bought) a poinsettia plant for the holidays, you may be tempted to throw it out with the compost when it stops blooming. But wait – if you’re willing to take just a little extra care for it, you could have that plant blooming again in time for next Christmas. 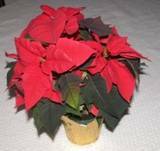 Poinsettias need special care to continue growing and re-blooming. They need a dormant period, like many other blooming plants. If you’re interested in keeping your poinsettia, here’s a good article on how to care for it throughout the coming year and have gorgeous flowers again next December. They are somewhat fussy, so you’ll have to evaluate whether you’re willing to put in the extra care, or whether you’d just buy another one next holiday season. But for those blessed with green thumbs, you may enjoy coaxing it along.